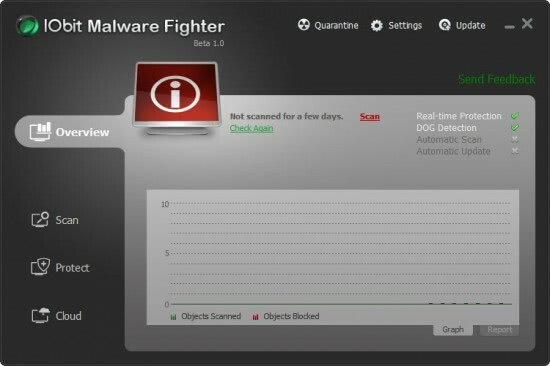 IObit has just released the first public beta version of IObit Malware Fighter, a new anti-malware software to detect, block and remove malicious software from Windows PCs. The beta version is currently exclusively available on the official IObit forum and on select third party download sites. Users who are interested in the application should realize that it is still a beta product, meaning that the software can cause problems on some systems or configurations. I did not experience any problems except for the occasional program termination during tests. The program itself seems well designed on the other hand and it seems unlikely that it will have critical negative impacts on computer systems. The application interface looks well designed. The application utilizes several guards that protect system modules and files. Guard can be activated and deactivated manually depending on the system configuration and needs of the user. No guard functionality information are provided in the application or on the website at this point in time. It is likely that IObit will either implement an on-screen help, help file or other form of guide for users of the software in the final release. Three types of scans are available; Smart Scan will scan critical operating system files, processes and locations. The full scan scans everything and the custom scan gives the user the option to select the items that should be scanned by IObit Malware Fighter. Users should take a look at the program settings for additional configuration options. Here it is possible to configure a higher protection level, the scan priority and other scan related settings or if DOG, the digital original gene heuristic malware detection algorithm should be used in addition to signature based threat detections. IObit Malware Fighter makes use of the cloud to analyze risks. The service utilizes IObit Cloud which is also accessible directly in the web browser. It is to early to tell how IObit Malware Fighter compares to other anti-malware applications like Microsoft Security Essentials. Interested users can download the latest beta version from the official IObit forum. Update 2: There is actually a free version of IObit Malware Fighter available. You can download it from this website. The free version includes the anti-malware protection and cloud computing technology, while the pro version offers enhanced malware protection, real-time protection, automated updates with high priority, scheduled scans and a license for commercial use on top of that. Ahh, more goodies from the company who don’t care about stealing the virus database definitions from the competition (Cough, Malware Bytes, Cough). Sorry but I’m sick of this firm and consider them low down dirty scum. Some of you might like their software but i refuse to give them any business on principle… I wonder if they decided to release a new app with a new name after ALLLL the bad press the last once got after they were caught out! A year or so ago, IOBit actually disassembled the Malwarebytes definition file and included the Mawarebytes work in their scanning tool. There’s several threads about this, with screenshots, on the Malwarebytes forum. This is reason enough to not ever want to even consider IOBit software in the future. Indeed. So far until now, I haven’t seen any single improvement on the last scanning programs after the incident. I’m not really like the programs anyway. Did IOBit have to go to court for stealing from MalwareBytes ? Like to see the evidence. No proof , no case. very good software for me.i like this software.emailme and chat with me .